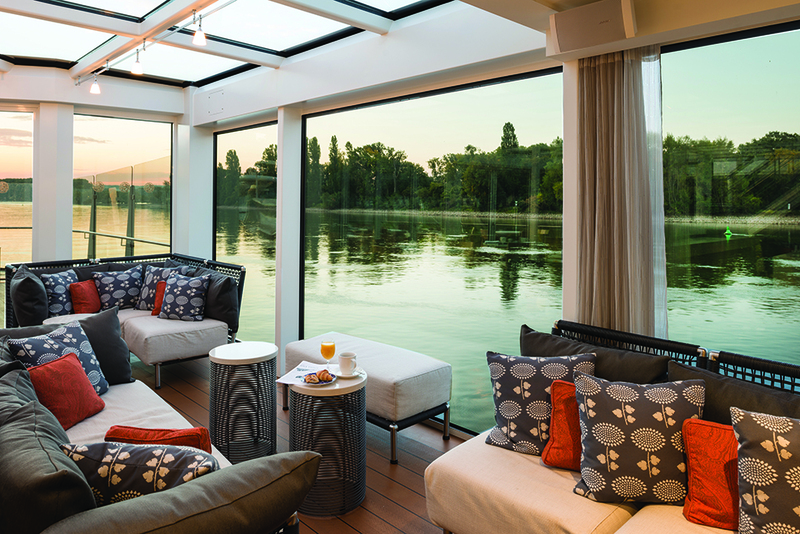 Innovative technological features, space-saving design elements, and ultra-luxurious amenities — there is an intriguing variety of what can be found across the river cruise lines we sell at Cruise Specialists. 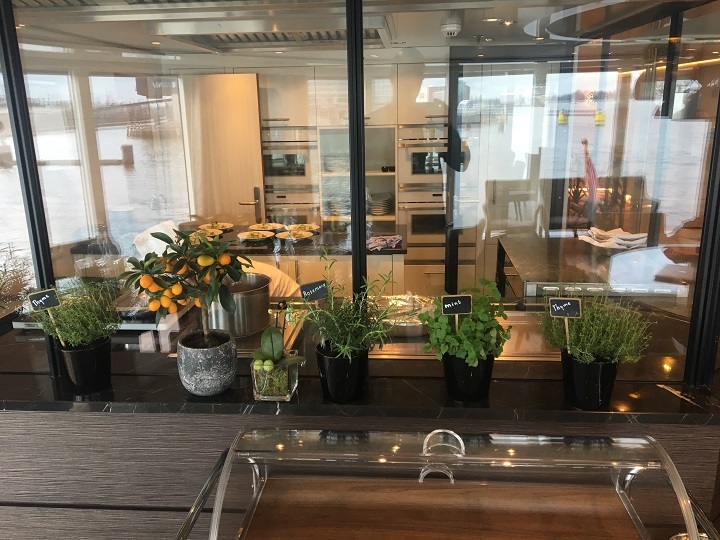 Our Director of Marketing, John Bell, recently had the incredible opportunity to tour seven river cruise vessels in a week’s time, during an exclusive cruise industry event. 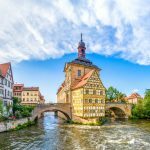 Read on for some of his observations about what differentiates these cruise lines, making for truly extraordinary river cruise vacations. Crystal’s four Rhine Class vessels carry among the fewest passengers of all of the river cruise ships we book at Cruise Specialists, making for an especially roomy feel. Crystal Bach is absolutely stunning, with common areas drenched in sunlight from abundant skylights overhead. John dined with Crystal President and CEO Tom Wolber, who reiterated that Crystal’s commitment to luxury passengers is greater than ever. 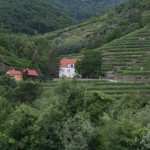 The Palm Court of Crystal Bach. The S.S. Antoinette offers an all-inclusive, boutique experience. The ship, along with other Uniworld vessels, is laden with original artwork, and no two suites are the same. At the touch of a button, slide down the window of your suite to convert into a balcony, without taking away any interior space. “The in-bathroom towel and floor warmers will be a treat for guests after a day of touring, especially appreciated on chillier days,” said John. As for cuisine, John reports that dining experiences on their ships are spectacular. Our clients who have cruised with Uniworld agree! John said The Leopard Lounge was one of his favorite spots on the S.S. Antoinette. Guest cabins on the Avalon Impression (and many of Avalon’s ships) feature floor-to-ceiling, wall-to-wall windows for soaking in the riverside landscapes. The luxurious feel carries over to the bathrooms, which feature marble vanities and L’Occitane bath products. The Avalon Impression docked at the harbor. Tauck is a truly all-inclusive product with no surprises or add-ons. The spacious Tauck Savor features lofted seating areas in many of the staterooms to maximize the view. The company has a rich history of operating land tours in Europe, providing guests with unique and exclusive shore excursions. The lounge named for Tauck chairman Arthur Tauck, Jr., on the Savor. John toured the AmaKristina with AmaWaterways President, Rudi Schreiner (who also designed the ship), noting the vessel’s modern design and many rounded edges, giving it an open and relaxing feel. A heated plunge pool on the top deck is a relaxing way to spend a couple of hours on scenic cruising days. 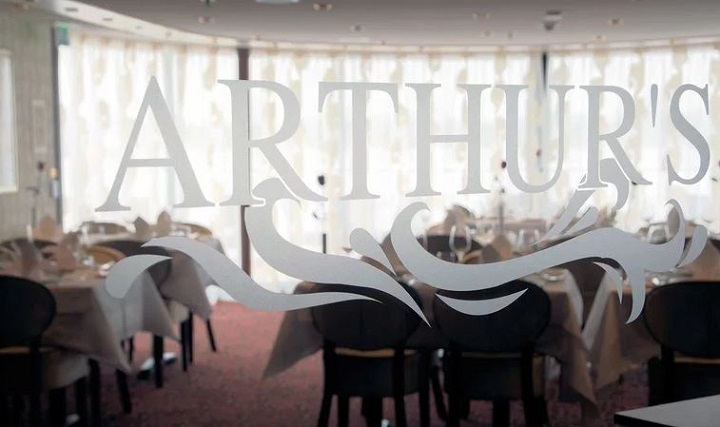 John and Rudi dined at the Chef’s Table, a gorgeous setting on the back of the ship. We highly recommend taking advantage of this dining experience, complimentary to each guest once during their cruise. Simply make a reservation once onboard the ship. Chef’s Table restaurant on the AmaKristina. Step aboard Viking Mimir or any Viking Longship and you’ll immediately sense the sleek Scandinavian design. When you’re ready to take a break from exploring off the ship, enjoy the indoor/outdoor Aquavit Terrace & Lounge, and Sun Deck with walking track. Uniworld’s two ships in this distinctive brand were designed with Millennials in mind. The two jet black ships, simply named The A and The B, feature communal dining, cabins wired for lots of mobile devices, and shore excursions tailored for an active and trendy set. Dine, the restaurant aboard The A by Uniworld. All in all, John had a memorable week exploring the variety of revolutionary river cruise ships. When asked about his favorites, John had a few examples that stuck out in his mind. 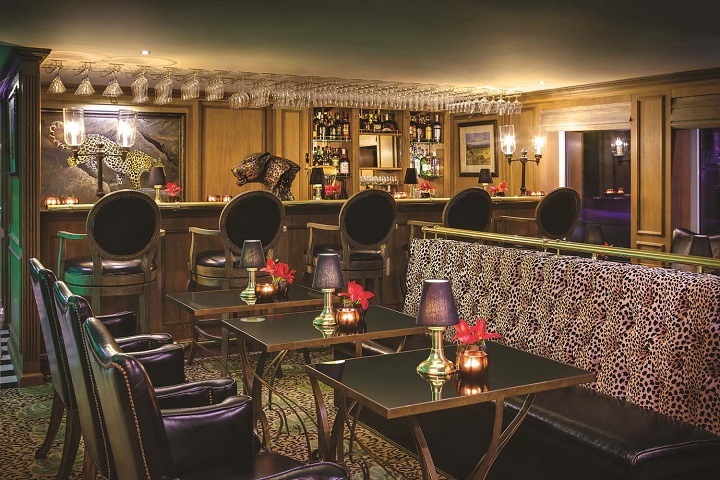 He liked the Leopard Lounge on Uniworld’s S.S. Antoinette, decorated in a jungle motif and decadently comfortable. 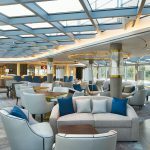 He also appreciated the Palm Court Lounge of the Crystal Bach, for its warm and open feel, thanks to skylights running the length of the ship, leaving the lounge sun-drenched and inviting. 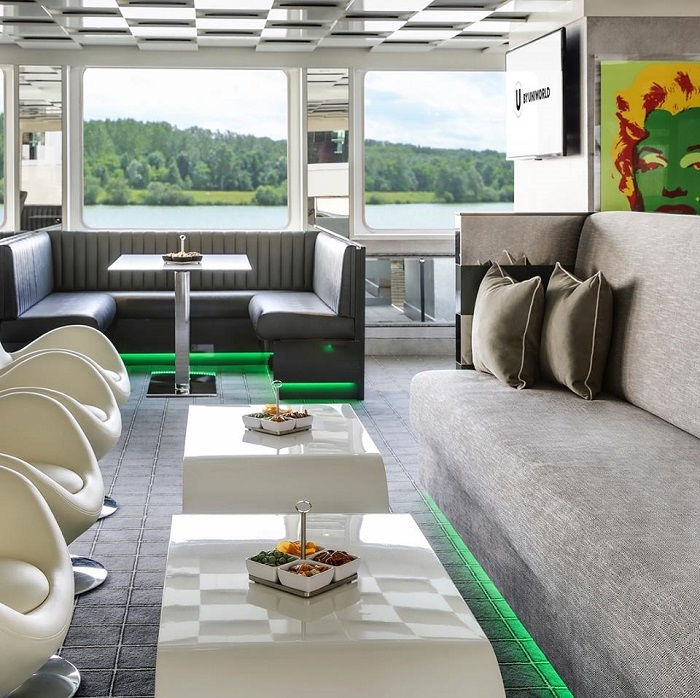 Another sun-soaked favorite of his was the Aquavit Lounge at the front of the Viking Mimir, offering comfortable seating for a great place to read or chat with fellow cruisegoers. 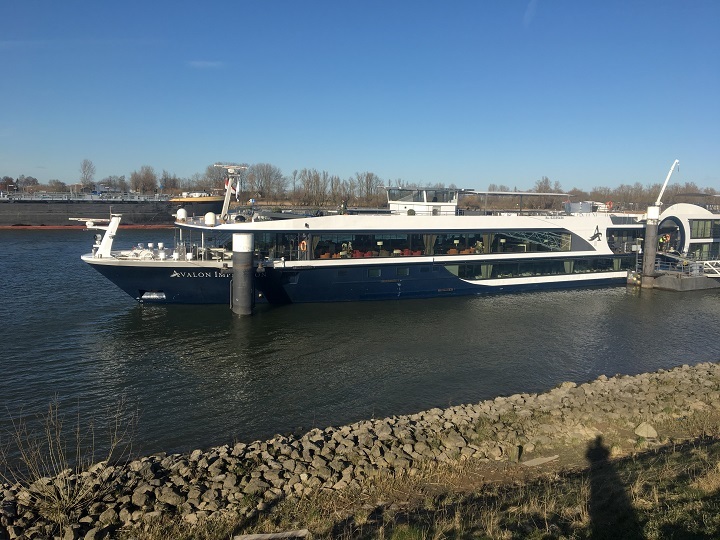 Ready to Book Your River Cruise? Don’t wait to book your next unforgettable vacation aboard a river cruise. 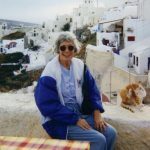 The friendly team at Cruise Specialists is ready to help, like our expert Cruise Consultant, Gillian Clark! We are excited to help you plan your journey.